Phosphorus is a vital nutrient for plants. Only about 30% of applied phosphorus in soils is available to crops and remaining parts gets fixed into insoluble phosphorus. This Phosphobacter Biofertilizer containing bacteria called Bacillus Megatherium var, Phosphoticum which secrets organic acids such as formic, Acetic, Propionic, Lactic, Glyconic, Fumaric, and succinic acids. These acids lower the PH and bring about the dissolution of bound form of phosphate. These plants can readily take this soluble form phosphorus. This soluble phosphorus is an important plant nutrient which is referred as the “master key” element in crop production. So this bacteria is called PSB (phosphate solubulising bacteria). Recommended crops: This is recommended for all types of crops like Paddy, Sugarcane, Banana, Oil palm, Mango, Grapes, Cashew, Cotton, Chilli, Sunflower, Mustard various oil seeds Maize, Wheat, Jowar, Oat, Barley, Bajra, Ragi, Sorgum, Turmeric, Tea, Coffee, Tobacco all types of fruits, vegetables, pulses and flowering Horticulture crops etc. Seed treatment: Prepare the slurry of lOOg of Phosphobacter and lOOg of Nitrogen fixer with 5 lit water; mix the seeds evenly in the slurry to get uniform coating on all seeds. Sow immediately after drying the treated seeds. Seedling treatment: Prepare the suspension of 1 kg Phosphobacter and 1kg of Nitrogenfix with 10 lit of water. Dip the seedlings in the suspension for 30 min and transplant the treated seedlings immediately. Soil Application : 15 kg Phosphobacter and 15 kg Nitrogen fixer mixed along with Compost or Vermicompost in 1:10 ratio to spread the material equally in an Hector. Packing: Krishna phospho is available in lkg, 2kg and 6kg packing. The normal dosage of Krishna phospho is 15-20 kg per Hector. Dosage will vary based on various Geo & Climatic conditions, crop and soil requirements. 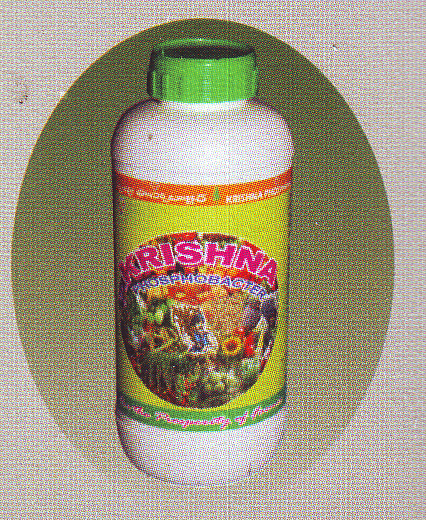 Krishna phospho is available in liquid form also and should be applied by drip irrigation or spray per Hector on 2 litprs basis. Liquid phospho is available in 250ml, 500ml & 1000ml basis.